There are some many articles that explain why lemon water is so good for you, and I particularly loved one from Tasty-Yummies. 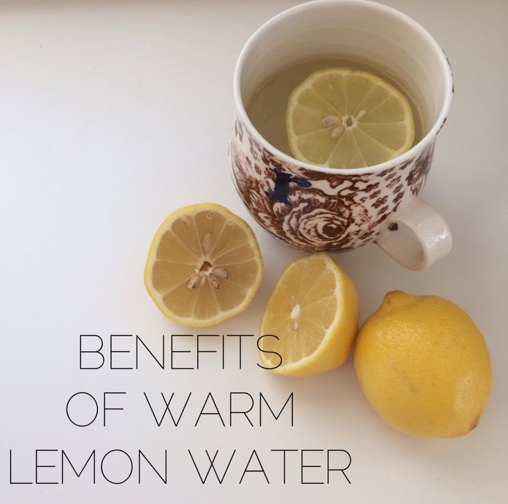 Here’s why you should be adding warm lemon water to your morning…. 1. Lemon water helps aid is digestion and flushes out toxins from the body. 2. It cleanses your system and aids in detoxification. 3. Boosts your immune system, since Lemons are high in vitamin C.
4. Rejuvenates and clears skin. 5. Lemon water increases energy and enhances mood. 7. Aids in weight loss, because lemons are high in pectin fiber, which curbs cravings. Also, one of my favorite benefits is that it replaces the “Do not speak to me until I have my coffee” moment (which I am extremely guilty of). I found that once I have my warm lemon water, I feel more awake an alert sooner than I would with coffee. Once I’m done, I also don’t crave coffee as much. So how can you not love a drink packed with all this goodness?! Trying adding this to your morning and see all the wonders it works! Reblogged this on Mind & Paper.